KEY VERSE : He said, "I am now 120 years old, and I am no longer able to lead you. The Lord has told me, 'You will not cross the Jordan River'. Deuteronomy 31 vs 2. (NLT). BIBLE READING : Ecclesiastes 12 vs 1 - 14. What is expected of us in this youthful age? "Remember now thy Creator in the days of thy youth, while the evil days come not, nor the years draw nigh, when thou shalt say, I have no pleasure in them". Eccl. 12 vs 1. Moses spent the best part of his life working for God and when he was well stricken in age, he handed over to a youth, the responsibility of leading the Israelites. Joshua was a youth when he started leading the children of Israel. (Deut. 31 vs 6). David was a young boy when the Lord used him to defeat goliath. (1Sam. 17 vs 33, 42 - 45). Joseph was a youth when he fled from (sin) Potiphar's wife. (Gen. 39 vs 12). Read through the scriptures and you'll find examples of people who did great exploits for the Lord in their youthful age. The likes of Timothy, Caleb, Daniel, shadrach, Meshach, Abednego and the list goes on and on. What exploits are you doing for the Kingdom at this stage of your life? Or you're waiting to be well advanced in age before you devote your life to God? Brethren! Now, is the time you can serve God best. Don't waste your youthful age and expect to give God what's left of your old age. Fun, pleasure and all the satisfaction of this world shall all pass away. As Children of God, you're to put the world behind you and put the cross before you. 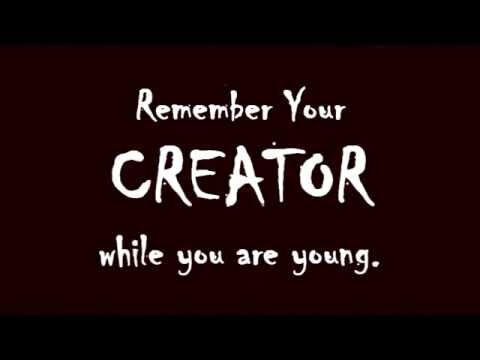 You were created specially for HIS pleasure (Rev. 4 vs 11) and you must live to fulfil that purpose. Age is not a limitation. God qualifies anyone/everyone He calls. "Moreover whom he did predestinate, them he also called: and whom he called, them he also justified: and whom he justified, them he also glorified" (Rom. 8 vs 30). You are not too young to work for God. You too can do exploits.